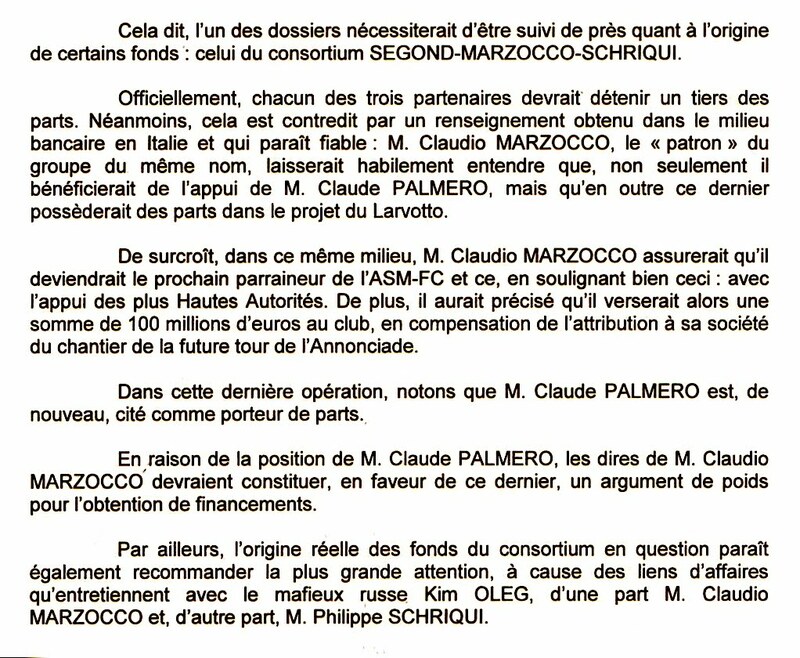 Early on, Monaco's police department decided to closely monitor the MARZOCCO-SCHRIQUI consortium, especially its sources of funding. Officially, both Claudio MARZOCCO and Philippe SCHRIQUI held a one-third interest in their consortium of investors. That "ace" was Claude PALMERO, the Chief of Administration at Palais de Monaco and personal accountant to Prince Albert II of Monaco. Palmero, the police learned, was a "unitholder" in the Marzocco-Schriqui consortium. Which is another way of saying Palmero had accepted a silent stake in exchange for influence. So: The Marzocco-Schriqui consortium ran an agent of influence inside the Palace to manipulate (or so they believed) the decision-making of the sovereign prince to their favor. Palmero held of position of extreme trust and should have been 100 percent loyal to Albert. Instead, in a clear conflict of interest, Palmero operated secretly, in partnership with private interests, to enrich himself. Marzocco, in his dealings with VINCI, a large French construction company, had retained a lawyer. Not just any lawyer. Thierry LACOSTE, then (and now) Prince Albert's personal lawyer. When the Marzocco-Schriqui consortium got ruled out of the final round, sore losers Palmero and Lacoste convinced their boss, the Prince, from going forward with the Larvotto extension. A Palace insider told us later: "They thought they may get another chance if the Larvotto extension is ever resurrected." But with the Larvotto project terminated, Prince Albert was ripe to be manipulated by his closest advisers into creating "alternative" space. A forty-nine-story skyscraper called Odeon Tower, now under construction. So who got the contract to construct what will be the tallest building in Monaco? Yep: Marzocco and VINCI, with Lacoste on retainer. Monegasques should now ask: Does Palace bean-counter Claude Palmero own a secret stake in Tour Odeon? And what else has the dirty duo--Palmero & Lacoste--manipulated Albert into approving? At the beginning of this post we mentioned that Monaco's police were suspicious of the Marzocco-Schriqui funding. Question: Why were they suspicious? Answer: Because of Claudio Marzocco and Philippe Schriqui's business ties to a local Russian mafia figure. If Prince Albert possessed even an ounce of integrity, he would launch an official investigation into widespread corruption, and demand the immediate resignations of Claude Palmero and Thierry Lacoste. Coming Next: Oleg Davidovic KIM, the Russian mafia figure tied to Marzocco and Schriqui.